ATDF Journal-AfCFTA Volume 9, Issue 2 2018 on African Continental Free Trade Area (AfCFTA) looks at Economic Transformation and Regional Integration in Africa. 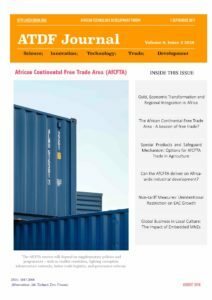 Till now, the role of intra-African trade has been limited as African economies trade relatively little between themselves. Now, African leaders are determined to change that. The signing of the African Continental Free Trade Agreement by fourty nine African Heads of States ushers a new mometum towards economic integration on the African continent. The new free trade deal replacing the current regional and bilateral trade agreements covers more than 1.2 billion people with a combined GDP of around $3.4 trillion across Africa. It is to be eventually extended to create common policies on investment, competition and intellectual property. It remains to be seen how many more countries sign up. Nigeria and other countries are cautious about the prospects for success, as no one knows with certainty what the CFTA means for economic growth and prosperity and may have limited benefits.